Around here they do a drop off at the police department. Maybe call your pharmacist…..otherwise we burn our garbage and I just throw it away and burn it. This weekend is the DEA’s National Take Back Day! You can find where you can drop your medications, expired, or not, unused, or unwanted here. Most pharmacies will take them too. Don’t flush them. Mix them up with used coffee grounds and discard in the garbage. Please remember that medications (prescription and OTC) not disposed of properly i.e. flushed or thrown in the trash can end up in our drinking water. Most pharmacies will dispose of them properly for you for free. The CVS’ near me all do it so I would start there. My CVS would not dispose of them for free but would sell me for $10 a postage paid envelope to send them to a disposal company. Your local pharmacy should have a disposal program. All of the chains and smaller ones in our area do. I actually did this yesterday! I’m nesting and finding lots of areas to organize before the baby gets here. Thanks for the help! Our medicine cupboard is in the kitchen so I cleaned it the other day! so I guess I just get to relax today once I am finished my list of 7 things. I am guessing next month won’t be a cleaning series. Hmm…. perhaps a money saving adventure of sorts? Or paper clutter? I was just coming over to comment about proper disposal of medications. Check with local pharmacies or even the police department about proper disposal. Our local communities are having a “drug take back day” tomorrow for people to dispose of unwanted/expired meds. Thanks for this info! I found several sites near me and lots of scary stuff in the medicine cabinet from my kids getting their wisdom teeth out and surgery I had a few years ago. I just did this the other day! I didn’t keep up with all the assignments, but did several. It’s fun, well as fun as cleaning gets :), doing it with others. Thanks for the list. I will pull it up from time to time as I keep our home in tip top shape to sell. A friend’s daughter works for a company that distributes OTC drugs and she says they are still good for a year after the expiration date so you may want to hang on to that expired Tylenol, etc. Also herbs are typically still good for up to 10 years past the date on them. Please verify this for yourself if you are unsure. Hmm…next month’s challenge…. maybe a financial one or a cooking/baking/freezer cooking one? I’ve loved the challenge, but I am so happy to end with an easy task! YAH! I was just thinking this might be on the list….I’m waiting until school is out to do all the ‘assignments’!! Instead of spring cleaning at my house, it’ll be summer! I am doing the same thing this summer Anna. Only 25 more days of school here! YIPEE! Thanks for this series. I did not find Assignment 15. Was it clubbed with 14 or 16 by any chance? Will this be available in June? I am back in the classroom full time this year for the first time since my 6 yr old was born and want to do this start to finish during summer break. If not I will pull them off and put them in a word document. Hopefully I can also follow along with whatever you have going then. A printable ebook is coming next week with all the assignments! Do you have any idea yet what/if you will charge for the ebook? Will it be viewable on kindles, nooks, etc? Or will it be more like a word doc since you said it would be printable. I’m trying to guess next month’s project. Coupons, menu planning, or financial organization? Maybe something with goal setting or routine/schedule making? Wow – I was looking forward to catching up on all the cleaning I missed in May! I have a list of about 6 cleaning projects I didn’t complete yet. BUT…I enjoyed this series so much that I’m excited to see what’s coming next. And of course, those cleaning projects were mostly just missed because I made great gardening progress this month. So I’m totally off the hook! And I cleaned out my medicine & related cabinets in February, so I’m off the hook for that, too. Which means I get to vacuum closets instead! My guess is…20 days to a more simple life. Thanks for the fun challenge. I bombed it this week, as it was TOO busy, but I at least have some challenge ideas. I have a medicine basket in my linen closet. But I have not gone through it in a while so this is a good task for me. I know we can dispose of any unused medication in our area at the local police station. I really appreciated these assignments…things I normally wouldn’t think to do. Thanks for all the links at the bottom. I’ve pinned them so I can come back and do them again soon. Yee-haw! I did this yesterday as well! Nesting in full swing! My guess for May’s challenge is 4 Weeks to a healthier you, focusing on mind, body, and spirit. 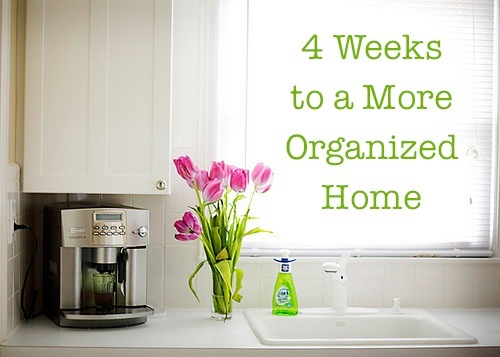 Do you have a list of all the days for organized home in 20 days. I missed a few and have tried to go back and find them. I have been doing some of them at my mother in laws since we live with her till june and then we move I can do this in a few months. Actually, I seriously need help getting my file cabinet decluttered and “minimalised”. I have a metal, two drawer file cabinet in my bedroom that I want to par down to one of those little plastic file boxes. I struggle to know what documents I really should hold on to and what I can let go of, such as manuals to electronics and appliances, monthly bill statements, etc. I hold on to a lot of paper, just because I’m never sure of what I really will need in the future.